It’s the holidays and that means gatherings filled with great food, good wine and warm conversation: at least that’s the happy part of the holidays that I choose to think about. Not the frazzled shopping, fighting for parking, writing cards, cleaning up all the junk at my place and inevitably, forgetting to do something that was supposed to have been completed weeks before. That’s part of this season as well. Last Saturday we had the chance to watch Hiroshima perform their 11th “Spirit of the Season” concert at the Aratani Theatre. It was my first opportunity to hear the new Bose sound system and it is flawless. The theater is a fantastic venue for concerts and Hiroshima certainly put the new sound equipment through its paces with a concert divided between original Hiroshima songs and updated holiday classics. I think my favorite moment was when the guys in the band (Dan Kuramoto, Kimo Cornwell, Tex Nakamura, and Dean Cortez) reluctantly donned tiny reindeer antlers and little Christmas hats at the behest of June Kuramoto, smiling innocently. June is always so warm and friendly in concert, her positive energy shining through the koto. I imagine her backstage cajoling the guys into wearing her holiday haberdashery. Their warm rapport comes from decades playing and traveling together. Terry Steele and Yvette Nii, a Hawaii native, performed a lovely duet of “Silent Night” in English and Hawaiian before we were sent out merrily into the chilly J-Town night. Dan mentioned a couple times that their annual holiday concert is more about bringing folks back to Little Tokyo and the theater itself. Afterwards I picked up a flyer for the upcoming world music series at the Aratani. It looks to be an exciting line-up, presenting a series of concerts as a passport to the world. First up in the New Year will be Angolan-born singer and guitarist Waldemar Bastos, followed by the Japanese taiko group On Ensemble. JACCC is so central to the local JA community and it’s good to see them moving into 2015 with innovative programming. What is a “cup” of rice? It’s a long-standing argument Eric and I have and one I’m hoping our readers can help settle. Early on when we would cook together, Eric asked me how many cups of rice he should make. Without thinking I said “two,” and 30 minutes later ended up with way too much rice — more like three cups by my estimation. 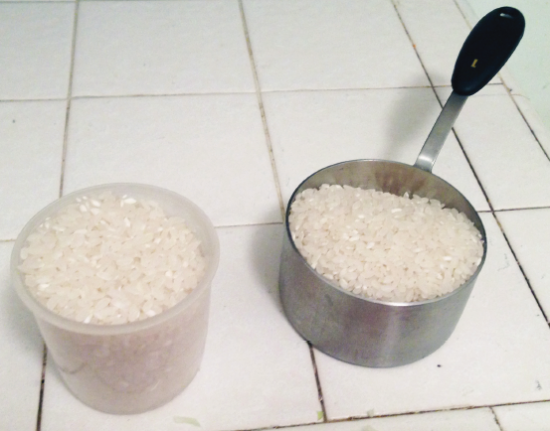 For Eric, a cup of rice is a standard cup (240 milliliters), which he always cooks on the stovetop. Stovetop rice must be the way gohan was made before the invention of the rice cooker. To me the best part of stovetop rice is the crispy koge on the bottom, something I remember my dad making with old rice when I was a kid. A Zojirushi cup of rice and a standard measuring cup of rice. In terms of cup size, I always measure rice in terms of those little plastic cups provided with the rice cookers. According to the Zojirushi website, their rice cup is two-thirds of a standard cup. My argument with Eric is that the Zojirushi cup is the way to measure rice, not the standard U.S. measuring cup. When you ask Japanese Americans (like me, for instance), “How many cups?,” the cups that they have in mind are those little plastic ones. Rice is something all Japanese Americans have strong opinions about: how it’s cooked, washed, which brand is the best, California rice or rice from other places. For instance, I know many Nikkei who have switched to brown rice, citing its health benefits over white. On the other hand, there are others who would never touch the brown stuff. And of course, no self-respecting JA would be partial to the Uncle Ben’s variety. A recent study by the University of Virginia pointed to sociological differences between rice-growing cultures and wheat-growing cultures. According to study leader Thomas Talhem, growing rice requires more cooperation and societies such as Japan and China became more interconnected and cooperative as a result. The other side of that argument is that wheat-growing societies became more individualistic and independent. Apparently a wheat farmer doesn’t really need the cooperation of his neighbors, unlike a farmer who harvests and plants rice paddies. He needs to drain and irrigate in conjunction with his neighbors. It may explain why Asian cultures tend to value group harmony over individualism.